In the latter half of the 6th century A.D., mold-blowing of glass was revived in a novel way, to produce six-sided vessels that could be decorated with all kinds of images, secular and religious. The mold itself was made of two pieces of bent sheet metal, and the decoration was pressed out of each mold's surface so that it appeared as an indented impression on the body of the glassware. This technology may have been inspired by the shape of ceremonial incense burners (censers) that were in vogue at that time. One of the True Cross motifs on our Pilgrim flask matches the one erected by emperor Theodosius II in A.D. 420 at Golgotha, which then was envisioned as the "navel" of the Earth. 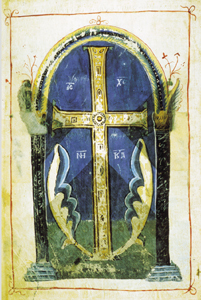 The True Cross amid a cluster of branches or leaves matches the notion of the Cross as life-giving and the early Oriental traditions of the Tree of Life. 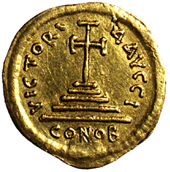 The True Cross atop three steps was described by the pilgrim Theodosius, who wandered the Holy Land around A.D. 530. It is this image that eventually appears on coinage issued some fifty years later. The "lozenges and dots" motif that occurs three times on our pilgrim flask may have been copied from decoration that often was punched into leather binders for revered texts. Highlighted left to right: "Golgotha," "Tree of Life" and "Three Steps"